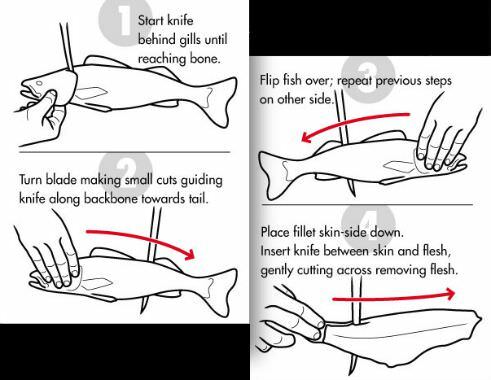 Welcome to our complete and simple guide for filleting fish, equipped with easy to follow step-by-step instructions along with pictures to illustrate the process. We've also included a video to provide you with a visual. You'll see tips and strategies about applying the basic filleting method for most fish, skinning fillets, and suggestions for smaller ones. Begin with a clean working surface. Perhaps even have a couple of clean hand towels handy. It's best to use a fillet knife that has a sharp and flexible blade, in which the length of the blade also fits accordingly for the fish. The Victorinox Fillet Knife Kit is a nice set to get slicing with. Behind the pectoral fin, cut through to the backbone. Then cut off the rib bones. Turn the fish over and repeat for the second fillet. Then cut off the strips of fatty belly flesh. You don't need or want the skin on your fish fillets? Well, then let's get rid of it. Be sure that the skin side is down on the bottom resting on the table or cutting board. Start by cutting into the tail end flesh to the skin. While holding the end of the skin firmly, run your knife through and away from you, moving the blade to slice along the skin to separate the meat. 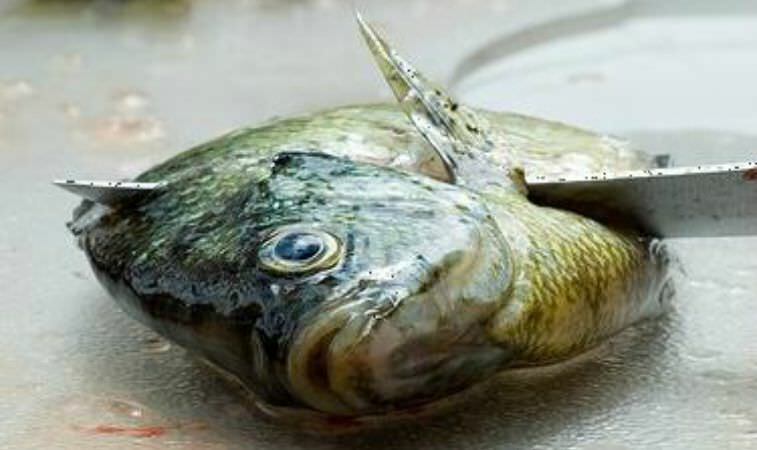 Smaller fish such as perch, crappie and bluegill are generally too small to fillet for the less experienced. Smaller fish obviously contain less meat. And if somebody isn't careful and efficient with preparing any kinds of fish at all, it can become a little bit of a concern when it comes time to eat. When filleting panfish, take the same approach as you normally would. Just be aware of how close the meat will be to the bones. Depending on how you plan on cooking and eating the fillets, I would consider leaving the skin on. The skin provides extra flavor. And you don't risk losing as much meat from skinning the filet. Ultimately, it's what you desire. Many people believe that it's more ideal to pan dress smaller fish instead. Either way, both methods are quite easy once you get the hang of practicing with a few panfish. This video below shows how to fillet a striped bass. Which is basically the same method used for filleting just about any other type of fish. By the way, in the video he refers to the striper as a "rockfish." Rockfish are sometimes referred to striped bass, rock salmon, sebastidae, the New Zealand rockfish, or stonefish. I just thought I would point that out to save any confusion, and to help clarify what kind of fish is featured in the segment. Do you think that you what it takes to yield that knife around? Great! This is what they should look like. Now it's time to throw those bad boys over a flame so we can get down to the real business of things and get our grub on! Check out some of our Amazing Fish Recipes. Get tips on the 10 Methods for Cooking Fish.